In this last month or so, we’ve been hit with a wave of terrific films, all of which I’ve tried to see and review. I only just found time to see Gus Van Sant’s Milk, which came out almost a month ago, making this review quite late. Normally, when I see a movie this long after it hits theaters, I forego a review, but this is a movie I have to talk about. Milk just might be the most important film of the year. Whether you agree or disagree with the idea of gay marriage, the passing of Proposition 8 in California, one of the most accepting places in the country, shows a widespread misunderstanding of the gay community. Before Proposition 8, Milk was set to be a powerful portrait of an inspiring, important man, but the passing of the Proposition gives the film an immense amount of added relevancy and significance. I doubt that anyone could walk away from Milk without feeling remorse for the outcome of Proposition 8; the story in Milk clearly mirrors current events, and Sean Penn’s powerhouse performance drives the message home forcefully. 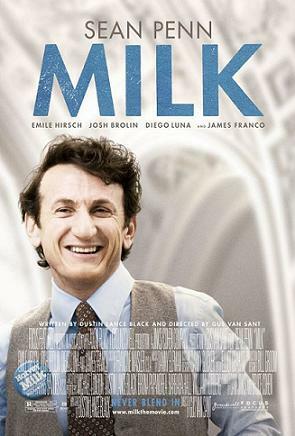 The film traces gay activist Harvey Milk’s life from his move to San Francisco in 1970 to his assassination in 1978, and the film does a terrific job illustrating just how much Milk achieved in those eight years. Before Milk arrived, San Francisco, though more accepting than other areas, was still a very dangerous place for gays. On the night he died, more than 30,000 people, all carrying candles, walked from Castro Street to City Hall. Milk examines what happened between those two points and how Harvey came to touch that many people’s lives; the story is one of the most exhilarating, fascinating, and inspiring stories of the year. Unlike your typical biopic, the film rarely goes further than known fact, making it feel like a documentary. Scenes are interspersed with historical footage and narrations based on the tapes the real Harvey Milk made shortly before his death, in anticipation of an assassination. The docu-drama feel doesn’t always serve the film perfectly. For the first hour or so, the pacing is a bit off and I felt as though the film wasn’t sure if it was going for ‘documentary’ or ‘biopic.’ The last half irons this problem out, though, and ultimately this storytelling technique is used effectively. Sean Penn deserves every bit of praise audiences can throw at him for his performance as Harvey Milk, because he goes beyond simple imitation. It is a complete transformation, and not once do you feel as though you are watching an actor. Penn simply becomes Milk, and portrays the man as the most loveable, friendly person you could ever imagine. Through a mix of terrific writing and phenomenal acting, you feel as though you know Milk as a personal friend by the time the credits roll. The film delves into every aspect of Harvey’s personality, psyche, and life history. For me, though, the most powerful, important ‘character’ moments come when the film illuminates Harvey’s motivations. In the first half of the film, Harvey tries to inspire young gay men to help him with his cause, and aims to give them direction in life; he also attempts to get as many gays as he can to ‘come out of the closet’ and let the world know that they won’t hide. In the last half of the film, we learn through exchanges with other characters that Harvey spent the first forty years of his life in the closet, and that he regrets the damage he did to himself and others. When you see how far he’s willing to go to stop anyone else from having to go through similar experiences, the full power of the man and the film shine through. But Milk is so much more than a portrait of a man. It’s also a look inside the history of the entire gay rights movement. When Harvey says that “This is our lives we’re fighting for,” he isn’t kidding. Early in the film, citizens of the Castro wear whistles to alert friends to danger. Cops arrest and beat gays for no reason except bigotry. Once Harvey stops these petty acts of violence, the war against gays moves to the political stage and a Senator attempts to pass a proposition that would make it legal to fire gay teachers. Milk tells the story of a man and a movement, and the amazing part is how inseparably linked the two were, because without Harvey, there would have been no movement. The film’s ultimate power is its revelation of how hard Harvey had to fight for simple, every-day rights, and how different the country would be today without him. The excellent ensemble cast really brings this all to life; for this story to work, you have to love the characters and get past the shock of watching two guys making out. I’ve already talked about Sean Penn’s performance, and I can’t stress strongly enough how wonderful a job he does. No gesture or mannerism is out of place, and when he takes the stage to deliver a speech, you feel as though you are in a crowd, watching the real Milk orate. Beyond that, though, Penn’s performance shows that being gay doesn’t make anyone less human or less important, and that is the most powerful, illuminating element of his performance. James Franco is excellent as Milk’s lover Scott Smith, making me think that his uninspired performances in the Spider-Man films was probably just a fluke. Emile Hirsch continues to show off his acting chops as Cleve Jones, a young man disillusioned with politics and, perhaps, society. Ultimately, though, Cleve becomes Harvey’s most important ally, and after his death, Cleve works even harder to spread Harvey’s message. Hirsch makes Cleve one of the most loveable characters and consistently steals the show. Josh Brolin gives a fascinating portrayal of Milk’s assassin, fellow city supervisor Dan White. Brolin says more with facial expressions than he does with words, and until the moment he pulls the trigger, you feel sorry for White. The film and the performance examines the motivations for White’s unforgiveable crime, and if I have one complaint with this movie, it’s that Brolin is underused and they could have explored this even further. I’ll say it again: Milk might be the most important film of the year. Even taking Proposition 8 out of the equation, this is a movie that needed to be made. Gays are underrepresented and often misunderstood, and Milk shows just how much the gay community has gone through to get basic rights, while simultaneously illustrating the life of a great American hero. And when you do consider Proposition 8, and how closely the story of that vote mirrors the stories in Milk, the film gains incredible significance. The final scene, which combines staged and historic footage of the candlelight march for the death of Harvey with narration by Penn about ‘hope,’ is the most powerful scene of any movie this year and hits your heart on a number of levels. I know this sounds cliché, but you owe it to yourself to see this film, and I strongly urge you to do so.